Public health researchers and clinicians regularly work with people who have suffered physical and mental trauma. Knowing how to conduct a study or treat a patient while navigating deep emotional issues requires special skills and overall awareness of how trauma can impact the process and outcomes of participating in research and/or receiving health care. This book presents a diverse array of case examples from scholars of health-related topics, focusing on biographical narrative as a window into understanding key needs in trauma informed scholarship and medicine. Exploring stories from people of varied backgrounds, experiences, and contexts can help professionals within and beyond the academic research and clinical care spheres create rewarding experiences for patients. 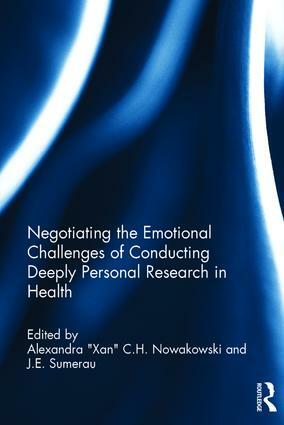 Negotiating the Emotional Challenges of Conducting Deeply Personal Research in Health will be of interest to public health practitioners, educators and researchers as well as students. Alexandra C. H. Nowakowski, PhD, MPH is an Assistant Professor at the Florida State University College of Medicine, and affiliate faculty in Sociology. Dr. Nowakowski’s research and other professional activities focus on the experience and management of chronic conditions, as well as disparities in the origins and outcomes of different health states. Dr. Nowakowski holds PhD and MS degrees in Medical Sociology from Florida State University, an MPH in Health Systems and Policy from Rutgers University, and a BA in Political Science from Columbia University. J. E. Sumerau, PhD is an Assistant Professor of Sociology at the University of Tampa. Dr. Sumerau’s research and other professional activities focus on relationships between gender, sexualities, religion, and health in the historical and interpersonal experiences of sexual, gender, and religious minorities. Dr. Sumerau holds PhD and MS degrees in Social Psychology from Florida State University, and a BA in Political Science from Augusta University.